Charyl passed away Thursday, January 31, 2019 in Schoolcraft. She was born July 8, 1945 in Plainwell, the daughter of Carl I. and Doraine (Denslow) Lindsey. Charyl enjoyed growing up on her family’s farm. She had been a medical technologist for area hospitals and had done consulting for universities. Charyl had also been a realtor and had earned Seller of the Month several times. She enjoyed following politics and the news, watching baseball and football, flower gardening and reading. Charyl was a skilled musician and liked playing the piano. She had a strong faith and had attended several churches. Surviving are her siblings, Daryl (Paula) Lindsey, Earl (Marla) Lindsey, Varyl (William) Zwart and Harold (Martha) Lindsey; sister-in-law, Sue Lindsey and many nieces and nephews. She was preceded in death by her parents and brother, Merl Lindsey. 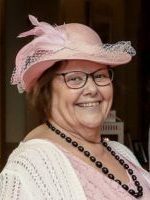 Friends may visit with Charyl’s family starting at 10:00 A.M., Monday, February 4, 2019 at the Winkel Funeral Home, Otsego, until the time of the funeral service at 11:00 A.M., with Celebrant, Mary Ann Devries officiating. Contributions in memory of Charyl may be made to the American Cancer Society, Alzheimer’s Association or to the charity of choice. My deepest sympathy to the Lindsey family. We sometimes walked together to the one room school on the corner. Such a sweet person, RIP Charyl. Cheryl was a friend of my sister having graduated from high school. I know Nancy will be very sad to hear of Cheryl’s passing. I’m so sorry to hear about her. We will remember her. Dear Family, I’m so sorry for your loss. Charyl was a very good friend of my sister’s, Karen, while in high school and even after they graduated. Because of her connection with my sister, I got to know Charyl and she was always so sweet. I loved her smile and dimples and her laugh was memorable. She came to see my sister while in the hospital before Karen’s passing in 2002. That meant so much to my sister. My thoughts and prayers are with you and may your many memories help you through your difficult times. My sister, Donna, called to let me know that Charyl had died. I am so sad to hear that! Even though I haven’t seen her or talked to her in quite a long time, we were very good friends and had so much good times together. My deepest sympathy to Varyl and family for the loss of your sister, she was so very lucky to have you and I’m sure she was very happy and felt so loved her last few months here on earth. God has received another angel, may she Rest In Peace.